The finish of the Women's 800 Final this year was a close one! We start the week off with the second installment of 5 Questions with a member of the 2012 London Olympic Team. I take personal delight here, because she's a Tar Heel! Alice Schmidt has been on the scene for over ten years now. Her first runs at the big time were her two runner-up finishes at the 2001 NCAA indoor and outdoor 800's, while at the University of North Carolina at Chapel Hill. Since then, she's made multiple World teams and now is a 2-time Olympian. She's always been stronger at the 800 meters, but ran a PR and the Olympic A Standard in winning this year' Prefontaine Classic 1500 meters. 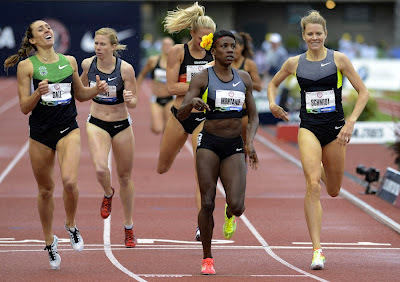 She'll run a few races before lining up for the Olympic 800 prelims on August 8th. 1. 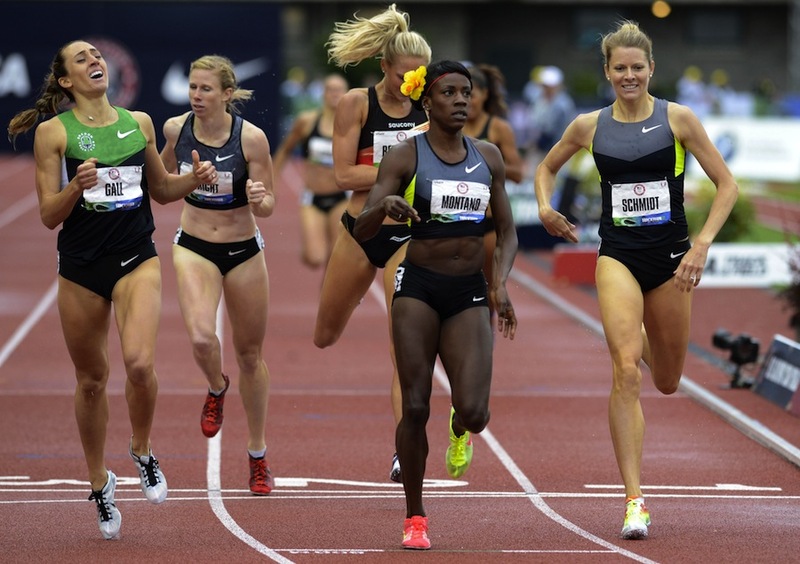 Writing About Running: The 800 Final at the trials saw five women within 0.64 seconds. What was it like weaving through the traffic in the final meters to make the all import top three, guaranteeing yourself a spot on the team? Alice Schmidt: The women's 800 was a nail-biter. We all knew that it was going to be a serious fight to make the team this year because the caliber of the field was so high. I've always said that in the 800, nobody in the final can be counted out because it's such a strategic sprint and anything can happen. So, in the final, I wanted to go out behind Alysia and relax in that position. I was hoping to make a big surge at the end for the win, but I found myself stuck on the rail for much of the final kick. At the end of a race, people usually run wide, so I was able to squeeze out to have a clear line to the finish, and I was able to surge into 3rd place. Whew! 2. Writing About Running: With that, congrats making your second Olympic team. What was the feeling this year in relation to how it was in 2008? Alice Schmidt: This year's 800 meter final had depth that I haven't seen in my career. Almost everyone in the final had the Olympic A standard; I think 4 of us had the standard in 2008. Obviously nothing was guaranteed. This year, I have been running a few more 1500s and doing more strength work. I was able to do speed work only in the last month or so. I kept having to tell myself that the "pieces of the puzzle" would come together at the trials, and thankfully, they did. Making the Olympic team for a second time was double-thrilling, seriously. 3. 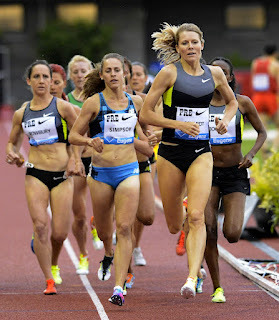 Writing About Running: At the Prefontaine Classic this year, you upset 2/3 of the 2012 Olympic 1500 meter team, running a PR and Olympic A Standard time of 4:05.64. You have had a lot of success in the 800. Do you see a future in the longer event? Alice Schmidt: My 1500 at Pre was a result of more strength work last year and this year. I've always raced the 1500 a few times a year, but last summer I raced the distance and won a couple of times in Europe. Still, I didn't have the A Standard. So, at Pre, I knew I wanted to get out of traffic, again, and I just went for it. I'm definitely looking forward to racing the "metric mile" more frequently! 4. Writing About Running: While at the University of North Carolina, you ran with two other future Olympians in Shalane Flanagan and Erin Donohue. How did your time at UNC and your relationship with these women shape you as a runner? the 4x1500 at the 2003 Penn Relays. Alice Schmidt: Shalane, Erin and my other teammates at UNC were critical in setting me up for success in college and as a professional. Having teammates who made it to NCAAs and got on the podium regularly set the bar pretty high. Successful athletics was the status quo. After college, I knew I wanted to find a similar atmosphere. As a resident athlete at the Olympic Training Center, I've got the same thing. My teammates there are not my training partners, but their hard work and success have inspired me to make teams and set my sights high. 5. Writing About Running: You have about a month until Round 1 of the 800 in London. What will you do to prepare over these last few weeks and how do you see your Olympic experience being different this time as a veteran of Team USA? Is there any European racing on your schedule in advance of the games? Alice Schmidt: I'm already in Europe! I left the USA a few days after the trials. I knew I would need to take a bit of downtime after my 6 races at the trials, so I figured I would "kill 2 birds with 1 stone" and get over jet-lag while resting my legs. I've got about a week of working out before I start racing here. I hope to get into 3 races or so, and I plan to stay in Europe until the Olympics. I've learned from previous years that I'm at my best after a few races in Europe, so I'm trying to put myself in the best position for the Olympics.